A sprinkle of fresh herbs can make any meal feel fancy and special. But it’s a HUGE challenge to use up that remaining bunch of cilantro or parsley before it turns brown and slimy. Especially when you’re only cooking for one or two people! Storing them the right way helps a lot, below are step-by-step directions on how to store your fresh herbs so they last longer. 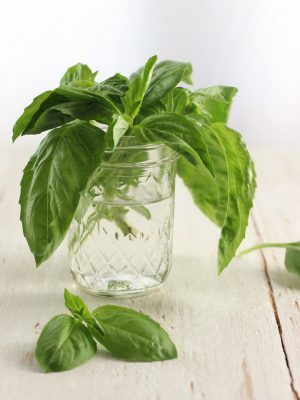 Basil is the easiest herb to store. Instead of tossing it in the fridge, you want to treat basil like it’s a bouquet of flowers. When you get home from the store instead of tossing your bag of parsley into the crisper, grab a cutting board and knife. Lay the bunch of parsley on the cutting board and chop off 1/2-inch to 1-inch of the stems. Add the parsley to a salad spinner and fill it with cold water. *If you don’t have a spinner you can rinse the herbs in a colander and move on to the next step. Use your hand to gently swish the herbs around in the water to help any dirt fall to the bottom. Lift the basket out of the spinner and drain the dirty water. Next, put the lid on the spinner and give it a light spin. Then dump out any water. Lay the herbs on a clean towel in an even layer to dry. I usually give them about 10 to 15 minutes and then use another clean towel to blot any excess water from the herbs. Fill a mason jar partially with cool water. Gather the herbs into a bouquet and place in the jar. You want to make sure the bottom of the stems are submerged in the water. Cover the herbs with a plastic sandwich bag and secure a rubber band at the top of the jar. The idea is to keep as much air out of the bag as possible. Place the herbs in your fridge. We usually store ours on the middle shelf if the herbs are tall like this flat leaf parsley. But you can put them anywhere in the fridge you want. Change the water every 2 to 3 days. Remove yellow or brown leaves s they appear. Wipe out any condensation inside the bag. 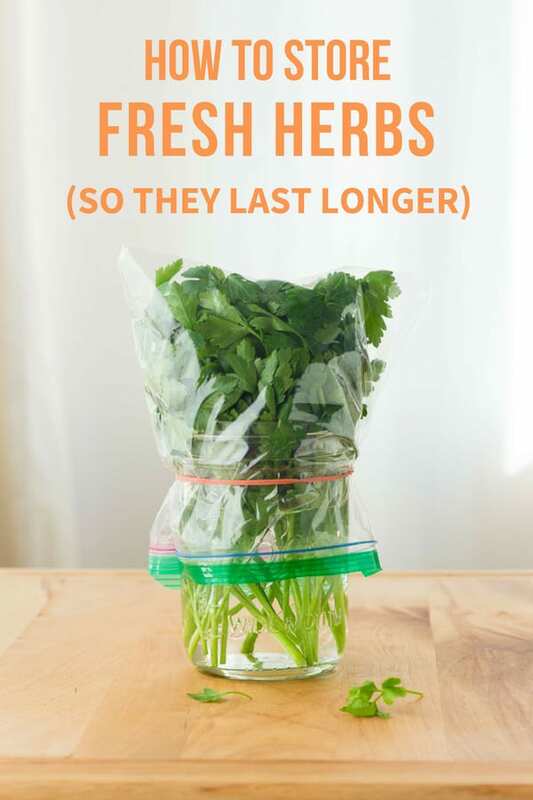 We’ve tried this method with fresh parsley, cilantro, and mint. All of the herbs lasted for weeks with the parsley hanging in there the longest (over 1 month!). You’ve got a few options when it comes to storing hard herbs i.e. those with woody stems like rosemary and thyme. You can keep them in the fridge or even freeze them! For either method, start by rinsing the herbs with water. Then lay them on a clean towel and pat dry or allow to air dry. Wet one or two paper towels and squeeze them out. Arrange rosemary in an even layer on the towels. Starting at one end, loosely roll up the towel. Place in a marked plastic bag and refrigerate. The rosemary (or other hard herbs) will last for about two to three weeks when stored this way. Because most rosemary bunches we buy are huge, I like to keep a little in the fridge and freeze the rest. After rinsing and drying the rosemary you can freeze the leaves right on the stems. Or strip the leaves off and freeze them separately. Another great option for storing herbs is freezing them with oil or broth in ice cube trays. Similar to how we add frozen lime juice cubes to blender salsa, you can easily add the oil + herb cubes to pasta and soups. Check out this post on freezing herbs in oil from Kevin Is Cooking for easy step-by-step instructions. Parsley + hummus is a delicious pair, sprinkle chopped parsley over a Veggie Hummus Flatbread for a bright lunchtime treat. Not just a garnish, Italian Flat Leaf Parsley makes a tasty addition to any salad. Grab a few handfuls (yep, I said handfuls!) and give them a rough chop before tossing into a Roasted Baby Potatoes and Chickpea Salad. 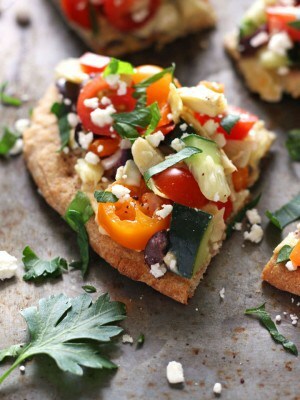 Grassy and slightly bitter, chopped curly parsley brightens up any dip or spread like these Chickpea Cucumber Mini Pita Pizzas. 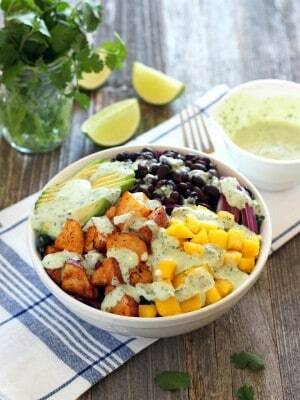 Pair cilantro with garlic for a bold and tangy dressing that perfect for topping two sweet and spicy Mango Sriracha Potato Veggie Bowls. Nachos without cilantro, Inconceivable! A bunch of aging cilantro is always a great excuse to make a batch of Toaster Oven Veggie Nachos or Easy Sweet Potato Nachos. Feeling adventurous? Try this Toaster Oven Baked Corn On The Cob With Curry Coconut Butter. The combination of bright and lemony cilantro, earthy curry powder, and creamy coconut butter is over the top delicious. Mint helps to balance the natural sweetness of berries and adds a bright touch to any meal. 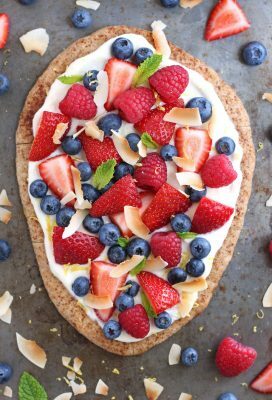 Try it on this Easy Flatbread Fruit Pizza that’s a great addition to any Sunday brunch or these almost-too-cute-to-eat Potsticker Fruit Tacos. My absolute favorite way to use up mint is adding it to all our beverages: hot tea, iced tea, or even a simple glass of water – it’s so refreshing. Got a great herb-saving tip? Please share your suggestions in comments! Thanks for the article…..it makes me want to use fresh herbs instead of the dried. I have lots of mason jars so my parsley and cilantro will be very happy!